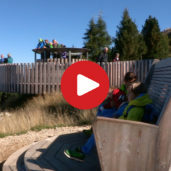 South Tyrol is a child-friendly area, not only due to the fact that there are plenty of playgrounds and a huge variety of destinations that are ideal for kids. South Tyrol is child-friendly, there are plenty of playgrounds, but above all there is a huge variety of destinations that are ideal for the little ones. Both children and adults will have fun in the adventure parks and on the high-rope courses. They will discover the animals‘ life or admire the beauty of nature during a hike. Be inspired by our family-tailored suggestions! A wonderful way to discover Scena is by looking for hidden treasure! An entertaining and fun day for the whole family. „Bauernlandzwerge“ - meaning „farmland dwarves“ in German, is a very popular children‘s programme in the Val Aurina Valley. Children aged between six and eight can participate. Each day has its own unique blend of fun and adventure. A visit to Castello di Tures, or a day at the farm. There are just so many things to discover in the Val Aurina Valley. The ski area of Klausberg, located in the Val Aurina Valley has a lot to offer during winter and summer. During the winter months, skiers from all over the world come to these slopes. The summer months are more suited for families with children. With a dinosaur park and a balancing course that tests the skills, there awaits one more adrenaline rush: The Klausberg Alpine Coaster! An adventure for the whole family! After a relaxing walk and a visit to the petting zoo, there is a special surprise waiting in the village of Villabassa. The Kurpark spa complex. Just the thing for recreation and relaxation. The Riolagundo forest-themed trail offers a unique, in-depth insight into the ecosystem of the forest. Visitors obtain plenty of information regarding the local fauna and flora, making this leisurely walk an interesting one indeed. We would be more than happy if you could join us on our trip as discover more about the forest in a playful manner. Fast slides, flying high and hitting the yellow mark. In the Kronarc Adventure Park in Valdaora, there is non-stop fun. Children and parents can test their archery skills or cruise up and down on a special skateboard. The motto here is to just go for it and try it out! Today we make a children’s expedition in the sunny uplands of Tesimo-Prissiano. At the “Vorbichl” the kids can let off steam and enjoy gorgeous nature. Come with us, search for the Swiss dwarf and listen to the particular sounds of nature in this area! Climbing like Spiderman or hiding in the forest just like Robin Hood, is possible at the „Kinderwelt“ in Valdaora. Here, children have free reign to let their fantasies run wild! Swinging around like Tarzan, building dams or balancing from one tree house to another is enough to get any child excited. Here, under the canopy of old trees, the sky is the limit. The Rainguthof farm in Caprile is a true paradise for animals. A newly constructed open air areal is the idea place for some rare animals to frolic around. Children can look, pet and feed the animals in exchange for a voluntary donation. During the year there is always offspring, for eg a small fallow deer or a fawn. A trip to this animal farm is always a wonderful experience for small children. Today we are going to walk on the “Hexenquellen” barefoot and adventure trail on the Alpe di Siusi pasture. It is a nature trail, which focuses on the senses and is enriched by natural material artworks. In the hiking region of Watles, a lake awaits with many interesting activities for the whole family. Situated in Burgusio in the upper Val Venosta Valley, cool temperatures can be enjoyed during the hot summer months. During this time, the lake becomes a small paradise for children. We decided to take a closer look. The Wild Man and the Salige are mythical creatures of the alpine region. These creatures accompany those thirsting for action on this family hike which goes through the pastures and forests of the Val d‘Ega Valley. The ‚Landartweg‘ hiking trail is simple, family friendly trail through the forests of Falzes. ‚LandArt‘ derives its name simply from the words, land and art that can be found in the middle of nature. Artists use nature as their studio, where they create new and artistic pieces by using diverse materials. We introduce this themed world, found in the middle of the forest, to you. Everyone should have fun on a family holiday and for this very reason, we are going to the Malga di Tarres, close to Laces in the Val Venosta Valley. Every Thursday is a family day and the operators of Malga di Tarres ensure that even small adventurers can make the best of every opportunity. Entertaining excursions for the whole family – The WoodyWalk is a perfect combination of hiking and playing. Mount Plose with its stunning views situated near Bressanone, offers a variety of adventures surrounded by nature. The “Latemarium” in the Val d’Ega offers 7 spectacular adventure trails below of the Latemar massif. On the 360 Degree Platform a fantastic panoramic view awaits us. Here our mountain experience starts and who knows… perhaps we see the legendary “Latemar Dolls” - they are said to be petrified… for all eternity! There is special place in Rodegno, where children’s eyes are filled with wonder… By Galtinerhof, young children have the possibility to see first hand how life is lived on a farm. The wide variety of animals that can be found here is almost guaranteed to light up a child’s face with a smile. Today we visit a few young adventurers who are taking the „Cribble Crabble“ climbing tour in Valles, a mountain pasture region that can be found in Gitschberg Jochtal. 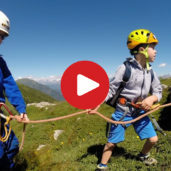 Together with their mountain guide Paul, the children can safely learn the professional way with which to use safety ropes, spring hooks and carabiners. Come with us and experience these brave children climbing and rappelling down the cliffs. In the high rope course garden in Obereggen, situated in the val d‘Ega valley, the children get to experience the thrill of climbing up 10 meters to balancing beams, nets, bridges and moving tree trunks. The kids show their courage, finesse and confidence. Immerse yourself in this climbing adventure! On vacation finally there is much time for fun and games. The kids want to let off steam, therefore playgrounds are suited best. Naturno offers the little adventurers the most beautiful playgrounds to climb, slide or to play minigolf. Linus and Laurin have tried everything, experienced what they already know and tested, how fast a water slide can be! In Scena and surroundings various short hiking paths for families exist. Fun and action make the little ones feel big here! The famous Austrian composer Gustav Mahler found inspiration here for some of his most famous works. Today it’s an attraction for both the young and the old where deer can be hand fed, owls, lynx and wild boar viewed and finally where local Tyrolean delicacies can be sampled in the parlour. Welcome to the Gustav Mahler Stube and wild zoo! A child-friendly and gentle introduction into the world of skiing sports is something the ski resort of Gitschberg - Jochtal can guarantee it’s visitors who will also definitely have a great time. 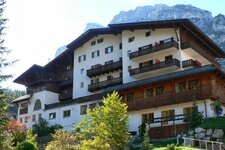 For many accommodations in South Tyrol it is self-understood that they provide for childcare and animation for kids in order to make holidays a memorable experience also for the little ones. Parents can sit back and enjoy the Mediterranean flair of South Tyrol, or experience this beautiful spot of land hand in hand with their kids. Whether you spend a day in one of the high-rope courses or adventure parks, or approach South Tyrol from its “animal” side, visit the Iceman or simply admire the beauty of nature, there is something for every family member’s taste. Moreover we recommend you to have a look at our event calendar that also provides a series of activities. By the way, special events such as the South Tyrolean Knight Games or witching hour on a castle attach a breeze of adventure to your family holidays in South Tyrol. Family holidays in South Tyrol - and you don’t seek the thrill or animal experiences? High-rope course Allitz "Litzer Waldele"